Perhaps we will see this set in summer, but confirmation is still pending, so stay tuned for more information(and thanks to HISS Tank boards member jcast for the heads up)! Click on the title bar to check out the new set! UPDATE: The auction for the set may have ended, but it seems the seller now has the individual figures up for sale, starting with one of the Hammer Drones! Sweet, I might get that for Fury and the drones. I was just wondering....Fury and Black Widow wouldn't really come with armor cards so does this mean they will never be single carded? Gonna hafta consider this set for the drones alone. WOOOOO, YES! 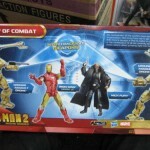 I wanted a couple of Army Drones and definitely a one eyed Samuel L Jackson figure, plus I have not picked up any of the proper Iron Man figures yet so color me excited. Hell yes!!! I can't wait for this set! I love the drones. I'm positive that these are the 3 3/4 inch ones, because the Fury we saw months ago looks pretty much exactly the same as this one, which was 3 3/4. man those drones are awesome!! definitely a buy! probably "War Machine ,2 Drones and Black Widow"
I'm pleasantly surprised by how big the drones are, they look to be almost a head taller than the Mk. VI, and a lot thicker, too. They look really sturdy. man those ground assault drone are detailed they even have the foot clamps that lock them to the ground for the heavy guns to fire. I'm really impressed with this figure line they get better and better with every wave! That machine gun does not look combat ready. The one on the left looks like it's bent so far that you can't even see it. I'm sure it won't be a problem with all the sets, but two messed up ones in the same pack is pretty peculiar. those are easy fixes though my biggest worries are paint issues or mold damages bends can be easily fixed. True, true. Really extreme cases like the one on the left appears to be can be trouble though. 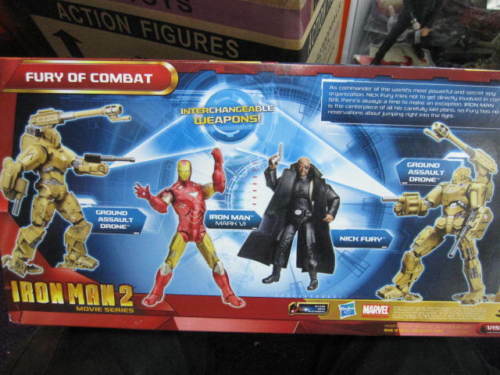 well thats the first time Ive seen one so extreme in both the movie and comic figure lines from iron man 2.
hey any news on the other drones and waves like when we can expect to see those out? I would think probably in a month or two since it was posted on Ebay. 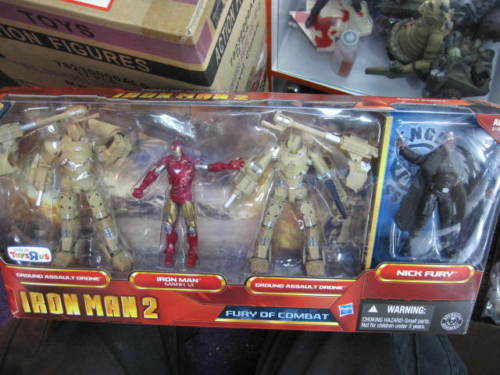 Anyways, I'm still trying to find Hulkbuster at local retailer in FL. You seen any in your area Nomad? 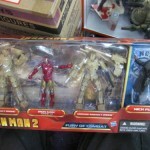 Yeah, still no signs of the Hulkbuster wave in down this way either.